I'm supposed to receive the flash by the end of the week and will post my initial impressions followed by a regular review once I've used it for a while. I do have a macro lens, the amazing/wonderful DFA 100 WR, and a few "close focusing" primes like my Sigma AF 24mm f/2.8 Super-wide II, but I'm not much of a macro photographer. I'm interested in using this flash primarily to help in poor lighting conditions like inside my house, especially when photographing my kids. I have been using a Lightscoop up to now (and have gotten some decent results) but wanted to get a simple and compact external flash. This one looks, on paper, like it should fit the bill for me. Can't wait to find out! Thanks for your quick post !!. 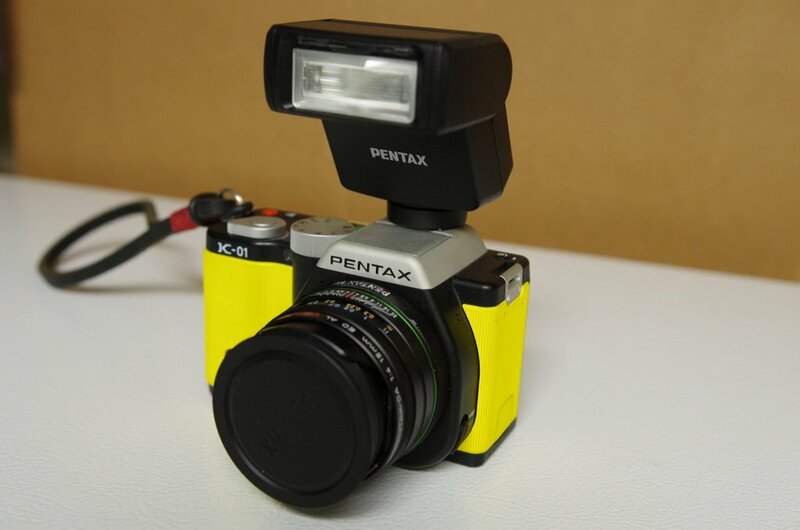 I have use Old Pentax flash 280 Manual flash.I see this new flash is small and price is right ! !.I will buy one by Dec of 2015 !! I hope it will produces good light for in door and some with Macro shot !!!. I did have a chance to put to through its paces, although not for my intended use. I'm more of a macro photographer but haven't done any trips to really give it a test. I did photograph a friend's wedding last weekend, and the AF201 did very well as an outdoor fill flash. Indoor bounce wasn't as impressive but it did help; not surprising since it's not meant to be a powerful flash. It was reliable and pretty accurate, and build quality seems very solid. Does that help? 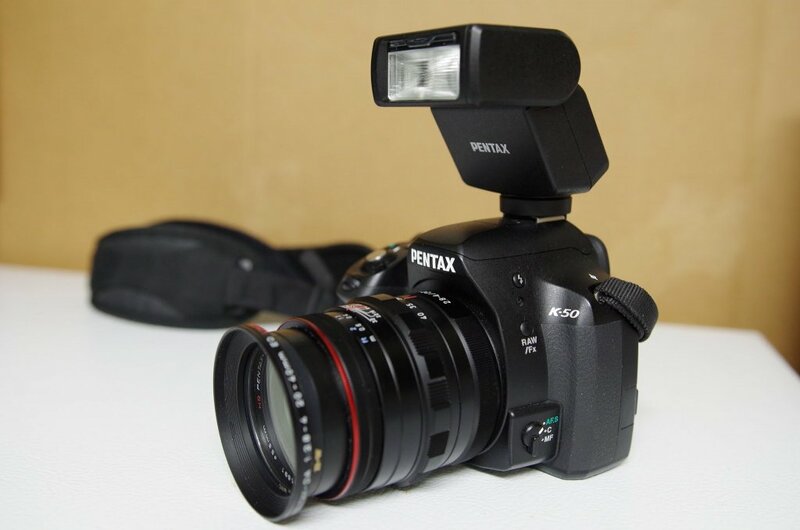 If you have test it with Macro shot .Please come back and post your opinion with this new flash. Any flaws like a flimsy battery cover? Yes, that is helpful, thank you! It is reassuring to hear that the flash performs well enough given its price point and compact form factor. I'm getting it delivered today so I'll be able to try it myself! The battery cover seems solid, locks firmly in place. I haven't notice any major flaws yet, but I haven't tested all the features yet. Recycle time seems a bit slow (maybe 4 second-ish), but that might be fine given that this isn't meant to be a high performance flash. Two AA batteries don't have much amperage so I wouldn't expect much in the way of recycle time. About 4 seconds for Ni-MH cells is what the spec sheet says with ~100 flashes. The battery cover seems solid, locks firmly in place. 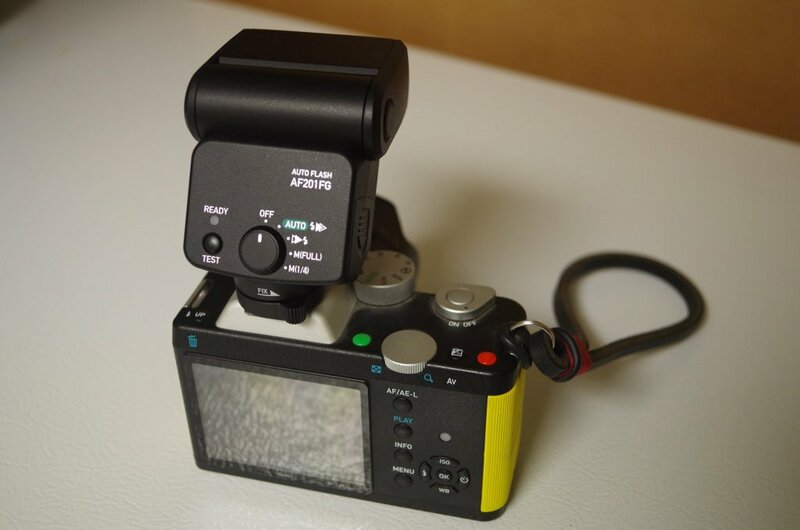 Here are some pictures of my new AF201 FG flash attached to my K-50 and K-01. It's two AAA batteries, and I only use Eneloop Ni-MHs. 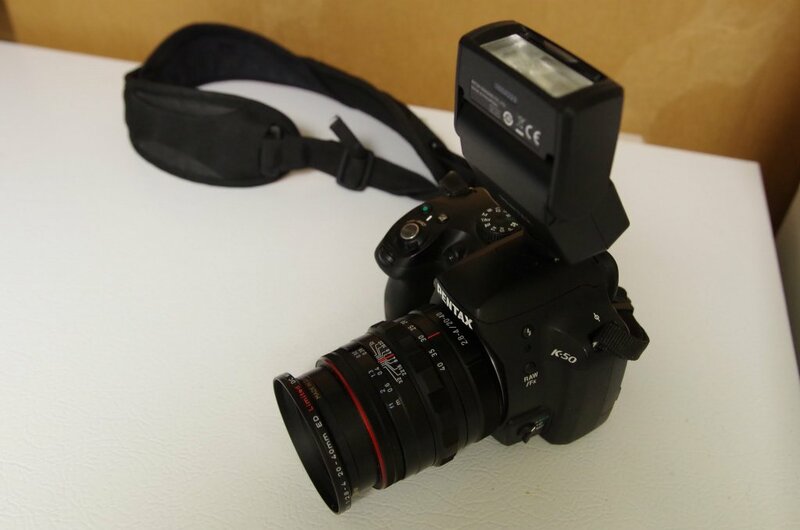 Thanks for sharing your images of the flash on your cameras.It looks good. I will waiting for your review about the performance !!! I also have a Metz 24 that I used on the K-01 (sometimes) but mostly used on my Q-S1. The metz also has tilt. 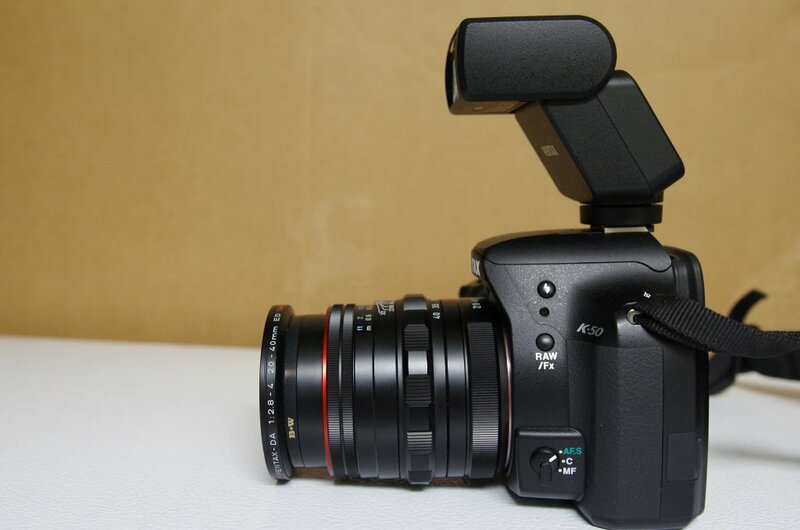 The build quality is horrible imho as the shoe mount is quite finicky. Sometimes it does not lock properly on the hot shoe. That being said, I like the flash as I use it as an Auto flash and it is quite good. somewhat of a bummer that they went with AAA instead of AA batteries. I don't like having so many different sizes. Because of this I might pass on this cute little flash and stay with my compact Chinese (manual) flash for now. Interesting to hear you say that ... much of the outrage engendered when we were told that the K-3ii wouldn't have an on-board flash was from people who depend on the OBF to trigger a gang of PTTL-controlled flashes. On the other hand, I have an appreciation for Auto flash that dates back to the days when flashes had more intelligence than cameras did. Well, waiting to see some macro shots using this flash. Another poster said the Vivitar FC-PEN cable was decent. It's going for about $14 at Adorama last time I checked. I might give the cable a shot.